Possibly worth an entire year’s subscription to Netflix (which is now free on certain T-Mobile plans), the second season of Stranger Things was released just over a week ago. Seriously, this is not just the best show on Netflix. This is the best show period. Nothing else holds a candle to it, except maybe The Goldbergs, but that’s a whole different genre. SOLD OUT – But Series 2 will include a set of Series 1!!! I love my set of season 1 cards, and can’t wait for the second series…but I’m very impatient. I have a handful more that I plan to post soon, if there is interest to see them. I’ve tried to keep them spoiler-free, but I offer no guarantees. 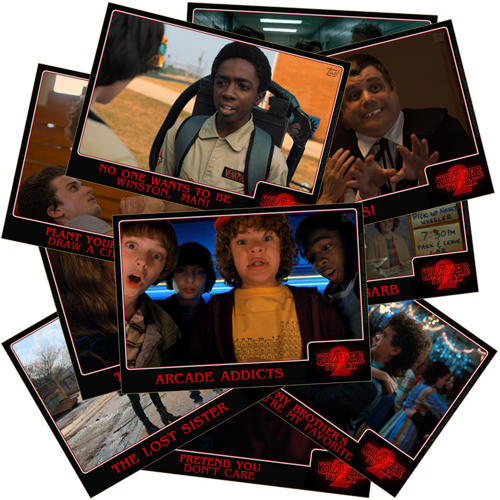 Posted on November 6, 2017, in horror, television, trading cards and tagged fun cards, Netflix, Stranger Things. Bookmark the permalink. Leave a comment.